A few months back I received an invite to Juicy Grill. It was apparently a new restaurant then and they sent me an email to ask me if I were interested to be part of the review program. Luckily I had Sissy to accompany me. The location was not hard to find. Things turned different after we reached there. It was the ground floor of a small hotel (Oyo Townhouse). We entered through the door but nowhere we could see the restaurant name. The cash counter was at the back of the room and there was nobody. For a new restaurant it was unlikely to have rush on a Sunday afternoon. There were few other people sitting, could not understand if we were in the right place or not. After half an hour or so, finally I could not take it anymore and walked up to a table and talked to one of the two people sitting there. They too came for the review program and it seemed that their time slot was differnt. They were served with the main course by the time when I talked to them. In starters we had Broccoli shrimp soup. I don’t usually have soup in restaurants because – 1) I get full very easily, opting for a basic soup would force me to compromise the main course. 2) I don’t see interesting options. Broccoli is a major turn-off for most people. The trick is to make healthy food taste good which worked out well for the soup. The soup was green, creamy with a hint of prawns. It was amazing. The next thing was Butterscotch caramel shake. The shake was fine, nothing extra-ordinary. There was a long wait after before the main course. I started wondering if they had forgot about us. In main course we had Tandoori chicken, chicken roasted in barbeque sauce, honey roasted chicken. The food was tasted good but it was cold. It was too much food for us 2. Then there was Spanish omelette with mushrooms. The omelette seemed to be dry and slightly lacking in taste. Now this is one of the things we usually make at home, this omelette tastes best when it is thick, not cooked for too long. Overcooking the egg makes it dry. Then there was a big bowl of pasta in alfredo sauce. The pasta was really good but at time point we were already full. There was spinach corn mashed potatoes and salad as sides of the chicken. There mashed potato was fine except there was no spinach or corn in it. In dessert we had blueberry pancakes, brownie. The brownie was the best. Overall it is a nice place to hang out with friends or colleagues. The sitting area is not very large, it can fit around 20-25 people. We had a chat with the manager and talked about the late service. He asked us to give a feedback on paper as well as in zomato. It was a great experience indeed considering the quality of food. Recently I ordered from this place again, the portion was good for 2 people. 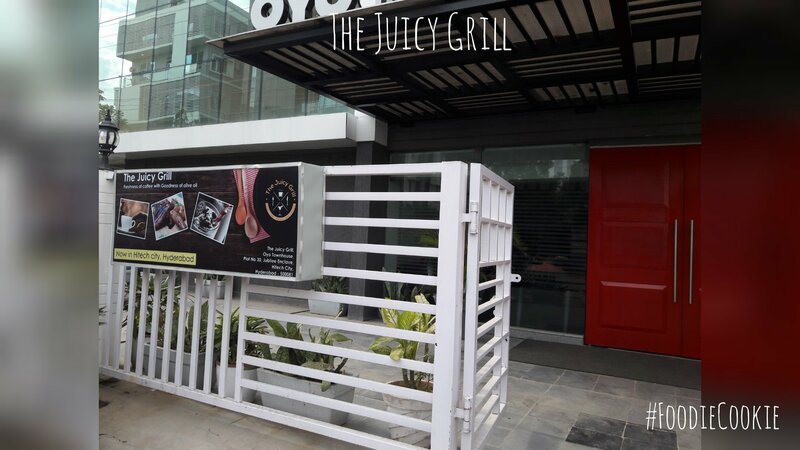 Usually I tend to check whether the restaurants serve same quality food outside review program and I must say The Juicy Grill has faired well in that test.